A forehead lift, or brow lift, is a facial plastic surgery procedure designed to elevate lax skin along the forehead and reposition the eyebrows for a more youthful look. In addition to rejuvenating low, sagging eyebrows, this procedure can also improve the appearance of the upper eyelids and soften creases and worry lines seen along the forehead and between the brows. Each brow lift is customized to meet the unique needs and goals of every patient to achieve optimal enhancement and a natural-looking result. Male and female patients who have undergone a brow lift with our board-certified plastic surgeon, James Matas, MD, describe having a more rested, energetic, and youthful appearance. Individuals who are well-suited for brow lift surgery are typically men and women in their late 30’s to 60’s or early 70’s who have become dissatisfied with the aging appearance of their forehead, brow line, and/or upper eyelids. Many of them may have already used BOTOX® Cosmetic to combat forehead wrinkles and are looking for a longer-lasting surgical solution that can smooth and lift the upper ⅓ of the face. In some cases, younger individuals who have an inherited, family appearance of drooping eyebrows may consider brow lift to create more aesthetically pleasing facial proportions, brighten the eye area, and contour the brows. Dr. Matas advises that non-smokers with good health and skin tone have the greatest possibility for an excellent surgical outcome. For more comprehensive rejuvenation, Dr. Matas sometimes recommends combining cosmetic eyelid surgery with a brow lift. The eyelid lift procedure allows him to remove excess skin and fat deposits from the eyelids to create a smoother, more youthful contour that can beautifully complement a more lifted brow line. 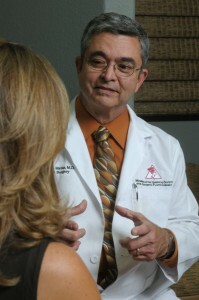 He will examine the structures of your face and eyebrows, assessing the quality of your skin tone and bone structure. He may also review photographs of you at an earlier age to determine how the aging process has affected the brow and forehead. Once your evaluation is complete, Dr. Matas will recommend the exact procedure, or procedures, needed to bring about the desired result. He will thoroughly explain the techniques and incisions needed, the type of anesthesia he plans to use, where the surgery will be performed, and the risks and possibility of complications. He may also recommend non-surgical treatments like BOTOX®Cosmetic or facial fillers, to enhance the surgical outcome. Once a surgical plan is established, you will be provided with the financial details along with a suggested plan of action should you decide to take the next step towards surgery. Prior to surgery, Dr. Matas will advise you to avoid taking aspirin, ibuprofen products, Vitamin E and certain herbal medications, as these can cause increased bleeding or have undesirable effects with anesthesia. The endoscopic brow lift technique uses a small rod-like device, called an endoscope, that is connected to a television monitor. A total of five small incisions of ¼ – ½” are placed across the forehead area, usually at each temple and several at the hairline, and this provides Dr. Matas with access to the scalp and all of the muscles that span the forehead. He then undermines and frees the tissue from the top of the scalp all the way down to below the brow itself. He removes some of the muscles that cause frowning, if necessary, and shifts the eyebrow upward. Once the new location of the brow position is determined, a sutureless mechanism called the Endotine® Forehead Device is tapped into the skullbone. The brow is lifted and placed over this device, holding the skin and soft tissue in its new location. The device will eventually be absorbed by the body, and by then, the tissue has healed in its new position. Due to the redraping of the scalp, there is no extra skin to be removed. Staples are used to close the small incisions. You will be discharged with a supportive head garment that will be worn for the first week. There is very little pain associated with a browlift, but any discomfort can be lessened with prescribed medication. Bruising and swelling over the eyelid and cheek areas may be noticed, and should completely resolve over the first several weeks. You will be given guidelines to keep your head elevated, to avoid strenuous activity, alcohol, steam baths, saunas and sun exposure. After one week, the surgical staples will be removed. You, or your hairstylist, will be able to wash your hair, taking special care around the incision areas. Typically, brow lift patients are back to work within a week to ten days. If you need it, special camouflage makeup can be applied to cover any bruising that remains. We expect that you’ll be quite satisfied with your refreshed and youthful appearance, no longer looking tired or worried when you look in the mirror. Friends, family, and associates may comment that you look different, but they may often think you’ve been on vacation or have a new hairstyle. You’ll have a higher brow position, a better arch to your brow and, if you had upper eyelid loose skin, this may be improved secondarily with the brow lift. Since some people have a different degree of droop over each eyebrow, this asymmetry will be corrected also. Long-term, the incisions will not be visible since they have been hidden in your hairline. How does a brow lift differ from a facelift? While a facelift is typically focused on enhancing the appearance of the jawline, neck (if combined with neck lift), and lower-third of the face, a brow lift is concerned with improving the upper third of the face. In some cases facelift and brow lift procedures can be combined in one surgery to rejuvenate both areas at once. How much does brow lift surgery cost? The exact cost for your brow lift surgery will depend on a variety of factors that can be determined at your consultation with Dr Matas. Since each brow lift is customized to meet the precise needs and goals of each patient, he develops a specific surgical plan during your one-on-one appointment and can provide you with an accurate price quotation upon completion. We also offer a free online cost analysis for potential patients who are interested in finding out more about the average pricing for the procedures they are considering. If you would like to explore the plastic surgery financing options that we offer, we encourage you to contact our team to discuss how flexible plans through CareCredit® can make treatment more affordable. Will my brow lift results look natural? With every patient and cosmetic procedure, Dr. Matas strives to create results that enhance natural beauty and do not look overly “done”. When it comes to brow lift procedures, his expertise, experience, and artistic instincts allow him to accurately assess his patients’ needs and design a surgical plan aimed at achieving natural-looking rejuvenation. The goal, as he explains it, is to help you appear well-rested and relaxed, rather than surgically altered. If you are interested in learning more about brow lift surgery or any of the other cosmetic procedures and treatments we offer, please contact The Advanced Centre for Plastic Surgery and schedule a consultation.